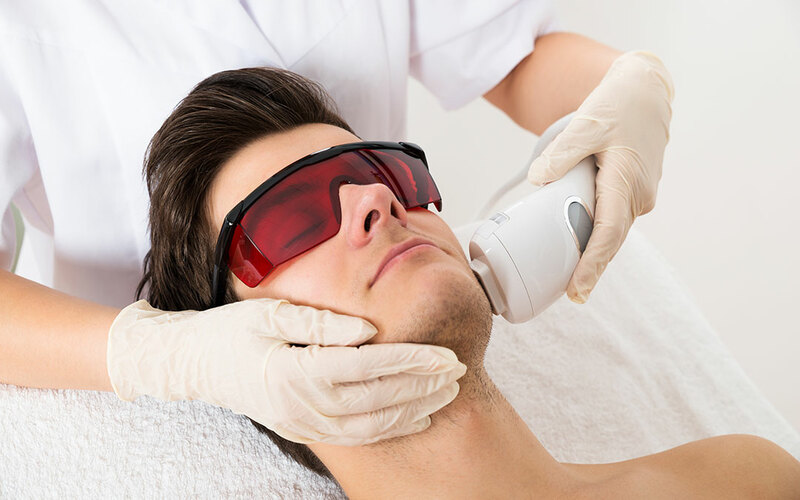 If you are a man, living in or near to Derby, who wants to remove, or just reduce, the hair that grows on your chest, shoulders or most other parts of your body, then laser hair removal for men is a great option. Thankfully, there’s no longer any stigma attached to male personal grooming choices, and that includes decisions about body hair. In recent years we’ve seen sportsmen, celebrities and other male role models lead the way in taking care of their skin and their bodies – and that includes ‘manscaping’, or the removal or shaping of body hair. Why men should consider hair removal by laser? When it comes to hair removal, men have the same choices as women, with the most obvious, traditional solutions being shaving, waxing or hair removal creams. 1) Waxing is painful, let’s be honest. It’s an ‘all or nothing’ solution. If you wax an area, all the hair is removed by being ripped out by the roots, but it will grow back and then you go through the whole process again. Laser is far more comfortable, our clients say, and sessions are quick so any slight discomfort is very short-lived. 2) Laser hair removal can provide virtually permanent results over time. If you want a hair-free back you can achieve it after a number of sessions and only a very occasional top-up treatment may be required if hair starts growing from previously dormant hair follicles. 3) If you just want to reduce hair on your hands, arms, chest or other areas you can have a session or two, which will stop hair growing from some follicles leaving you with a lighter covering of hair but not making the skin completely smooth. You are in control, and an expertly-trained laser hair removal specialist can work with you to get the results you want. 4) Razors can leave you with painful and unsightly nicks and itchy regrowth, you are really risking an embarrassing and potentially harrowing slip-of-the-blade injury. Don’t do it! 5) Hair removal creams are messy and some people find the smell quite unpleasant. Have you ever tried applying cream to your own back? It’s difficult and if you misjudge how long to leave the cream on you risk either sore, painful skin through the cream staying on too long or hair staying stubbornly in place because you washed it off too quickly. DON’T, whatever you do, apply hair removal cream to intimate areas. 6) The top-of-the-range LightSheer®Duet™ diode laser machine that we use at the Avance Clinic can be set to use the exact wavelength needed to effectively destroy hair roots without damaging the skin. A small, precise attachment on the handset means it’s possible to use laser hair removal on most parts of the head or body including noses and ears. What does laser hair removal for men involve? Any new client coming to us, or any reputable salon or clinic, should be given an initial consultation to discover what results they want. A patch test can be done so that the client can experience for themselves what laser hair removal feels like. Everyone’s hair grows at different rates, but our experience means that we can estimate how many sessions a client might need to achieve their desired results and we can discuss block bookings and costs. Laser hair treatment is a very clean and simple process. A small handset is moved across the areas of the body or face that a man wants targeting. In most cases, clients can be in and out of the clinic in a short space of time – so sessions can easily be fitted in to your lunch break, or before or after work. An intensely-concentrated beam of light heats up the hair root, permanently damaging it. Over time the hair is destroyed and will never grow again from that follicle. An average human has about five million hair follicles in total, including their head and body hair. Over time follicles that have previously been dormant can begin to grow hair, which is why we say that although laser hair removal is permanent, clients may need the occasional top-up treatment to keep that hair-free look forever. What areas of the male body are suitable for laser hair removal? Eyebrows – some men dislike the ‘monobrow’ look, and laser hair removal is a quick and easy way to permanently remove the hairs between the two brows. Ears – as we age, hairs start growing in places where they’ve never grown before. In women this tends to be the chin and upper lip; in men it’s often the ears. The delicate tip on the laser hair remover handset can target these unsightly hairs – and remove them forever. Nose – a specialist laser hair removal expert can precisely target straggly, visible nostril hairs. 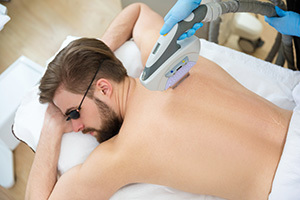 Neck – hair growth patterns vary between men, but if excessive hair on your throat and the back of your neck is a problem, you can deal with it permanently through laser hair removal and save the time that you, or your barber, would otherwise spend trimming it away every couple of weeks. Chest, arms, back and legs – sportsmen, including swimmers, cyclists and other athletes, may want hair-free bodies to improve their aerodynamics and shave (no pun intended!) vital fractions of seconds off their times. Other men may just want to be less hairy – and laser treatment can thin out hair on all these parts of the body without removing it completely. Armpits – thinning out excessive armpit hair, without removing it totally, is not only a look that many men (and women) prefer but it is more hygienic as less hair means less sweat can get trapped and turn into body odour. Feet and hands – dark, coarse hair on hands, knuckles, feet and toes can cause major embarrassment for some men when they are lazing on the beach or swimming; laser hair removal can end that humiliation. Why choose Avance Clinic for male laser hair removal? Avance Clinic is owned and run by Carly Bartram, a fully-trained, laser hair removal expert – so you know you are in safe hands. Avance Clinic is based in a quiet, residential suburb just outside Derby, so there’s no embarrassment factor for men who might not want to be seen walking into a busy beauty salon. Avance Clinic is within easy access of the major Midlands towns and cities via the M1, A50, A38 and A52. It’s easy to park on the road, close to the door. Appointments for hair removal can be booked to fit in with your busy lifestyle. Contact me today to book a consultation and a patch test to try laser hair removal for yourself.